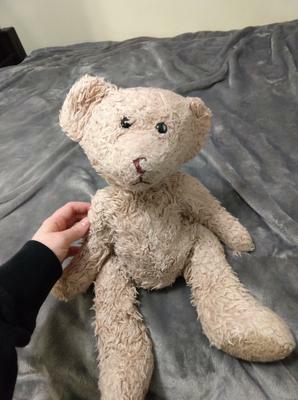 My friend has had this teddy bear since around the time she was born, which puts its age at approximately 25 years. This was probably purchased in the Carolinas area in the United States, and I doubt a large amount of money was payed for it. Unfortunately the tag is missing so we don't even know who manufactured it. I was thinking it looked similar in style to some Steiff bears but its head seems larger in proportion to most of those and the body is loose while a lot of the Steiff bears I see online look posable. Also the ears are bigger than most bears I've seen, and they're wider than they are tall, so perhaps that can help identify it. Unlike some of the other Steiff bears the paw pads are furry like the rest of the body instead of being made out of a different material. Perhaps it's just a knock off of the style. I also noticed the hair seems to be the same light tan color across the whole thing instead of having a different color for the muzzle or elsewhere. The arms are short and stubby compared to the legs. The eyes are circular black beads. The nose is trapezoidal and darker brown, and the nose is made of the same material and colored the same and makes an upside down Y shape. All 3 lines of the Y are nearly the same in length. The fur is very soft to the touch instead of being stiff, although this may have to do with the level of care it has received over the years. Any information about this bear would be appreciated, even narrowing it down to the company name would be great. I'm hoping to figure out what kind of bear this is and maybe even buy another one just like it as a gift.